Today is a special day—it marks the moment that I have spent exactly half of my life with Mark Justice Hinton. We met around Halloween in 1981, and I had just turned 27 six weeks earlier. Today I am 54 ¼; you can do the math! I hope the season is finding you hopeful and hale. 2008 was filled with projects, travel, joys, and sorrows. I continued to serve as Albuquerque’s part-time probate judge (www.bernco.gov/probate ) and the Court again had a record number of cases filed this year. We have finished a computer automation system to docket our cases, a huge change from the handwritten way we’ve done it since 1860! The public is now able to search our records online and see which cases have been filed in our court from 1975 to present. I was reelected in 2006 and my term ends Dec. 31, 2010 (we are term-limited, so will have to find something else to do in 2011). So Mark and I have two more years of health insurance and then…. In January I attended the mandatory probate judges statewide training. I participated as a presenter and audience member. Saw a few movies, continued to exercise, ushered a few shows at the University Fine Arts Hall. Continued to play internet scrabble with my friend Carol in Kentucky most Sunday evenings. We received a shipment of the new 2008 4th edition of my Life Planning in New Mexico book and have sold half of those this year. In February we lost my cat BabyCat to cancer at age 15. 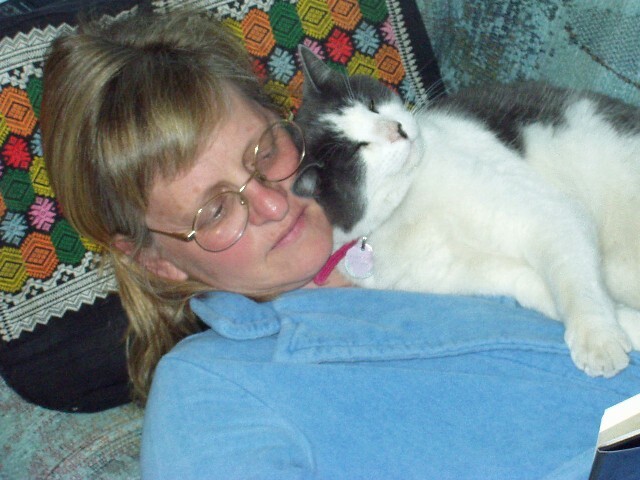 Since I didn’t do a letter last year, some of you may not know that we also lost our 19-year-old Kitty on July 3, 2007. Mark and I have blog entries posted about both cats. You can search www.merridancing.com/wp if you’re interested in the details. I still miss my BabyCat, although it’s been almost a year since he died. We were buds, as you can see by this photo. Lucky is an only dog now and getting pretty old himself. But he’s still with us. Toward the end of February I traveled to Buena Vista, Colorado to call a 4-day English and contra dance weekend with a wonderful, nationally known band called Notorious. (I highly recommend their new CD called Elkins; it is spectacular!) There were 6’+ of snow up there, and I travelled from my cabin to the dance hall via snowshoes all weekend. I wrote an article about the weekend that was published in the Country Dance and Song Society’s magazine. The weekend was fun, but a lot of work. Mark and I celebrated 26 years together in Feb. too! March stayed busy with work, ushering, exercising, social events, and company, including visits from Robert Coontz’s sister Connie, and her husband, father-in-law, and 2 kids. Former Albuquerque friends Eileen and Patrick also visited us from southern New Mexico, and we’re always happy to have an excuse to cook a fine brunch for friends. In mid-May my Aunt Jean called me with news that her breast cancer (mastectomy was in June 2004) had returned and spread to her liver and bones. We added another cell phone to her account so she can reach me at any time, and I promptly began to learn the medical and care-giving community in Miami and to help her with some financial and legal issues. She has been stable with the help of much chemo, other treatments, and pain medication. Not sure what her prognosis is, but I made trips to Florida in July and Sept. and will also visit in Jan. and April 2009. I got to attend New Mexico’s 4-day music and dance weekend over Memorial Day, as a dancer instead of a caller and that was fun. Also camped with Mark a few days at the end of the month. There was cell phone contact with my aunt even up in the mountains! Our Pilates teacher Gail turned 50 on June 1, competed in her first triathalon and was diagnosed with breast cancer a few days before the race. She chose to delay treatment for a few weeks so she could do the triathalon she’d trained so hard for. I had a free airline ticket to New Hampshire in June and saw my brother, wife and niece in Massachusetts and friend Ruslyn in New Hampshire. Ruslyn and I celebrated 35 years of friendship with a sailing trip on her husband’s sailboat. Encountered a terrible storm and I’ll spare you the gory details. Suffice it to say we all survived to tell the tale. Friends Susan and Paul visited NM the end of June from Missouri and announced that they planned to relocate to Tallahassee, FL the end of the year to be near her mom and sisters, who all live there now. July included a trip to Florida to help my aunt and then a 2nd annual camping trip to southern Colorado with 4 other friends and 3 dogs. It rained and/or hailed on us every hike, but we prepared gourmet dinners communally and had fun anyway camping beside a raging river for 4 days. Also saw a magnificent hummingbird in our campsite, which should not have been so far north (usually lives in Mexico). At the end of the month my 92-year-old friend Kathleen and I visited a newer facility that hosts senior residents and had a delicious lunch. Over the course of a month we arranged for her to move into a much bigger, nicer and safer apartment there without too much increase in costs. She moved in over Labor Day and is very happy there. Plus it’s only 2.5 miles from us, instead of 6. Mark started work as an author on a book called Digital Cameras and Photography for Dummies. (YES! These are those famous yellow and black books sold nationwide.) He got to use his own photos in creating the book, and copies of the beautifully finished book arrived on our doorstep in November. September featured my 54th birthday and another trip to Florida. Don’t even remember what I did on my birthday except went to brunch with my friend Mary and grilled filet mignon that eve with Mark. Kathleen’s daughter Kristi visited ABQ from CA and loved Kathleen’s new apartment. Mark finished the manuscript for Digital Cameras and Photography for Dummies just in time to teach a computer class at UNM and then start writing a new book for Wiley called Digital Photography for Seniors for Dummies, which is due the end of December. October was uneventful except for celebrating Noralyn’s 60th birthday with a special dinner here. Continued to help my aunt via 3-way calls, email, and cell phones. Voted on Oct. 9 (the 32nd anniversary of my dad’s death) so I could quit listening to all the negative campaign ads. Also continued to work producing and finalizing the manuscript of the Family Law book. November was full of major stress but some good things too. Mark and I both worked on books all weekend long before T-Day. 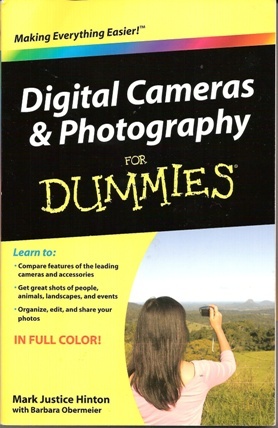 Mark had a deadline on his newest Digital Photography for Seniors for Dummies book. And I worked all weekend on his book, plus the Family Law in New Mexico book. I will spare you most of the details of Thanksgiving week other than to say Mark turned in his next ¼ of his book on Monday, then started finalizing the text of the Family Law book on Tuesday. The author and I scrambled to re-do a section the Wed. before T-Day. We wanted to send it to the printer that Wed. and have 4 days off. Got it into printer at 5 pm Wed. But it’s being printed in Canada and T-Day isn’t a holiday there (think their T-Day was in October). So bright and early T-Day morn the emails start re: problems—they had the wrong file of the manuscript. We finally straightened that out and I baked an apple pie for T-Day with Dave and Kathleen and Mary Smith. Friday morn the printer emails that the book manuscript was 3 pages too long. I spent Friday morning cutting 3 pages. A revised version of the cover went to the printer on Dec. 1. Then the proofs were supposed to be shipped to me overnight on Dec. 2. But they weren’t. They arrived Dec. 5, the day I was supposed to have them back in order to meet the shipping date of Dec. 19. I will say that the proofs looked good and that I reviewed them and shipped them back overnight mail within 4 hours of receipt. So we are not too far behind schedule and I can almost see a light at the end of the tunnel. We did have a nice T-Day finally about 5 pm. We brought a homemade pumpkin cake roll, homemade cranberry/orange sauce, and the apple pie. Hosts provided the turkey, stuffing, and gravy. Two others brought potatoes, rolls, veggies. Also, last weekend I succeeded in making pecan pralines (1st batch was runny, so it became icing for a spice cake). They were awesome and fattening! Mark’s book arrived and we love it (www.mjhinton.com/author has ordering details). Now the year is ending. My aunt started radiation this month for pain control of her bone cancer. Mark is working on the next 1/4 of his book, and I am reading those chapters. He’s gotten a little ahead of schedule, hoping to get some time off for holiday fun. And he has to teach one class on Microsoft Vista next week. Our “reward” is the 6th annual Bosque del Apache Wildlife Refuge birding trip, set for Dec. 22 with four other friends. December so far has been a better month— I even did a wedding at McDonald’s last Friday! I have also exercised more and walked more (in August I was diagnosed with osteopenia in my lumbar spine, but have opted not to take any meds for it). I am hoping the extra walking and calcium will help with the osteopenia. Plus I think exercise helps my mental health too; I didn’t exercise much in Nov. and was really stressed out juggling all the balls thrown at me. 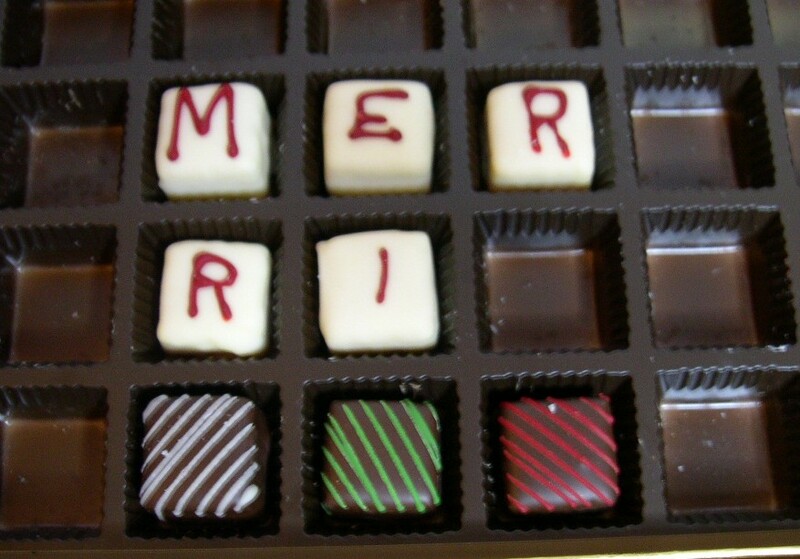 Today I am baking holiday treats to share with friends and getting packages ready to mail. That wraps up my year’s events. I hope that you had a great 2008 and that 2009 is health-filled and fun. Posted: 12|14|08 at 10:17 am. Filed under: xmas. Another Year & We’re Still Here! Hurray for Las Cruces Dancers!! !